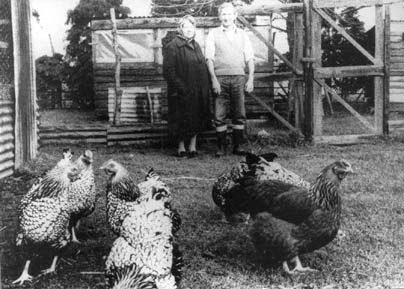 James Tarrant became the tenant of Saddocks Farm in 1894, the year of the big flood, and Manor Farm in 1906. In those days Manor Farm was owned by William Dugdale Stuart, the Lord of the Manor. His affairs were managed by his agents, Watney & Sons, a London firm and Saddocks was owned by the Crown. A flock of sheep were kept up to about the early 1920's - hurdle sheep, that are kept in pens by wooden hurdles and given a fresh pen every day over roots grown especially for them. The ground would be ploughed up as soon as one strip had been fed off by the sheep and pressed by a three-wheeled press, then sown by hand. During the First War the Army would purchase hayricks compulsorily. They appeared to have some sort of a baler as they had a rick at Manor Farm which they baled or pressed into trusses. Bob Blake, whose parents lived in Hope Cottage, lived in a caravan at Manor Farm later on in the War and for a while afterwards. George Prior, known as 'Tichy', lived in the cottage with his family up to the time when the South View houses were built, he was the first tenant in one of those. In those days the Common was not fenced, the roads leading off the Common had to be gated and there was a large number of horses besides cattle on it then, and often the horses decided to change from one Common to the other. When they came along the road and into the lane to the Little Common at the gallop on a dark evening, one had to get out of the way a bit sharp. It was dark as there was no street lighting anywhere around then. Long Close, where the Motor Museum is now at the bottom of Little Common, was occupied by Edward Quarterman and his wife as a pig farm, up to sometime before the Second World War They were quite old, and it was very isolated, no road, no 'phone, no electricity or gas, in fact there is no gas even now. Also on Little Common in the old days, there were three cottages; the tenants were the Hester's, Pither's and Wilcox families. They must have been very old cottages when they were pulled down and the tiles removed, they had been thatched previously. All the ponds have been filled in now; they provided excellent Winter sport in the old days. There was also a large one outside Manor Farm which spread into Saddocks Meadow, and one in Saddocks Yard. These ponds attracted quite a few youngsters, and older ones from the village, when frozen over and a lot of fun was enjoyed in the way of slides, skating and ice hockey with a tin can for a ball, which was not very pleasant when someone got hit on the side of the ear with a can. There was the game of 'dicky-night - show your light' in one of the meadows on dark evenings. On the Common there was usually football going on, with coats for goal posts; lots of players had hobnail boots which were very harsh on the shins. No vandalism in those days to speak of - a bit of mischief "yes". Then there was Major Morrel and his team who spent their Sunday mornings ratting with their ferrets which went a long way to keeping the rat population down. Pigeon shoots on Boxing Day were held for some time after the First War (with live birds not clay) but died out, rabbiting taking its place for a while. Eton Wick Cricket Club started up again just after the First War, having been played on the Common before the War. This time they played in Saddocks meadow, their secretary being Mr Percy, senior. A familiar sight between the Wars on the Slough & Windsor Railway was the Chalvey Matchbox driven by Bill Percy for quite a time until he was driving in and out of Paddington. The line was quite busy in those days, having through trains from Paddington to Windsor and Special Day trips from further afield; the line runs through North Field on its eastern side.